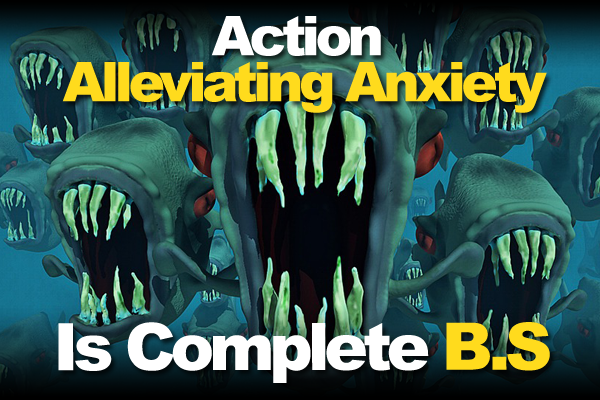 Action alleviating anxiety is complete b.s. It absolutely is. And everyone says that it is the cure. Well, it’s not the cure. In fact, it’s the furthest thing from a cure. Does it work? Yeah. To a degree. And that’s why you hear so many people talk about it as the magic pill to make you feel better. But it really doesn’t work to solve the source of the anxiety. I guess you could say in a matter of speaking it’s pretty much the same thing as a psychiatrist giving their clients anti-anxiety meds. The drugs help to alleviate the anxiety, but it doesn’t do a damn thing to fix it. And in this podcast episode of The Other Side Of Being An Entrepreneur, you’ll see exactly why all this is happening. You’ll hear what happens because of always taking action to alleviate anxiety and the real truth on what’s causing your stress. Now if I’m being honest, it wasn’t until last week I actually realized what the solution to the anxiety issue is, and I’ll share that with you as well. But I couldn’t stress enough that action alleviating anxiety won’t work in the long run. Especially if you live a life of hustle and grind. So if you deal with anxiety and stress, and you take action to try and deal with it, you’re going to want to listen to this short podcast episode. Listen To Why Action Alleviating Anxiety Is B.S. Why action alleviating anxiety is B.S. Why the hustle and grinders need to hear this more than anyone else. Eh, no it does NOT. It only alleviates it in the moment. If you listen to this episode you’ll hear all about this in detail. Action does not alleviate anxiety… in the long run. In the moment it does, but it will NEVER solve the problem.